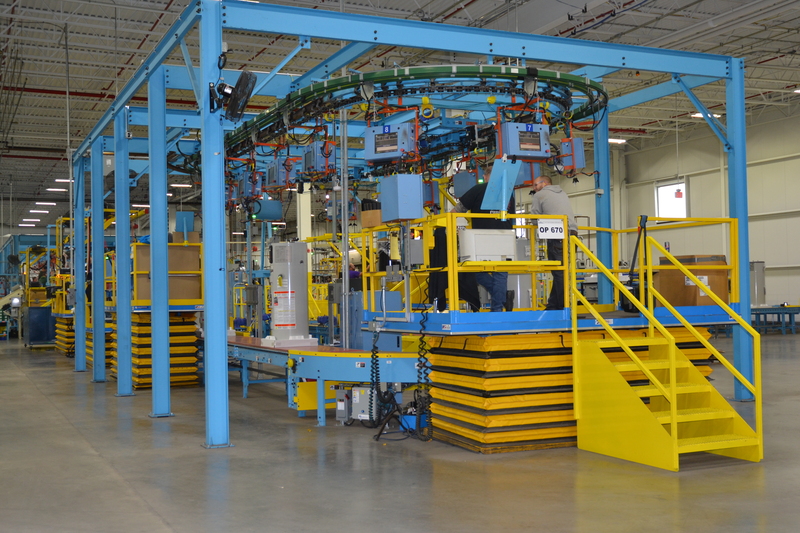 Quality and continuous improvement are the focus at Bradford White’s Middleville, Mich., plant. “Made in the U.S.A.” is a term that is as rare today as it once was ubiquitous. But water heater manufacturer Bradford White is building their products—as they always have—in America. The Bradford White manufacturing and distribution facility in Middleville, Mich., a few miles south of Grand Rapids, covers more than a million square feet and continues to expand. It’s one of the company’s three manufacturing operations; the others are in Niles, Mich., and Rochester, N.H. Water heaters and storage tanks ranging from two to 200 gallons all come off the assembly line in Middleville, where the company’s roughly 1,500 employees all share a common focus—ensuring Bradford White’s products are Built to be the BestTM. The staff of Southern PHC magazine recently had the opportunity to tour the Middleville plant and watch as water heaters, both residential and commercial, were constructed from raw material to finished product. There’s a family atmosphere at Bradford White. Our guide for the tour, Chris Jones, the company’s director of continuous improvement, has held several different positions during his nearly 15 years with the company and greeted employees by first name as we made our way through the plant. He pointed out that, in many cases, several generations of a family have been employed by Bradford White. Bradford White’s Middleville plant is U-shaped, with products and materials entering on the right, then moving into the center where the tanks are built; the tanks then feed into the left wing, where assembly and distribution take place. Currently, about 40,000 water heaters are built there each week, with projects to increase that capability for 2019 in progress. 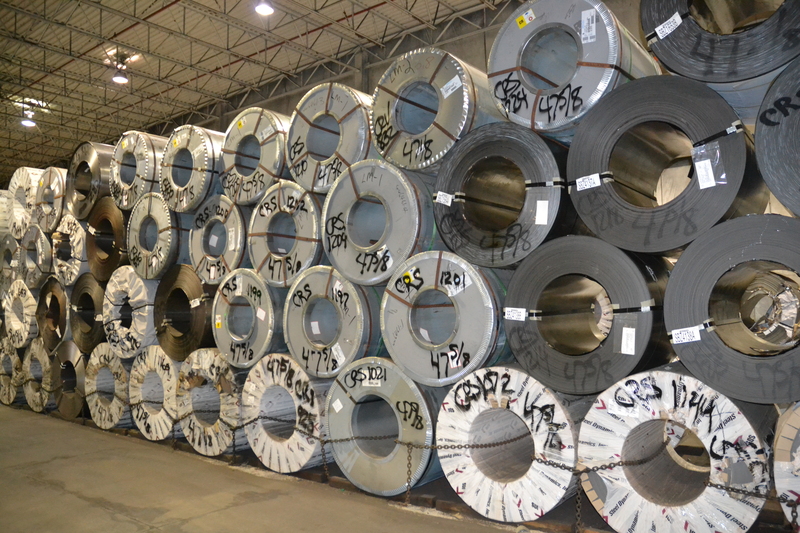 Bradford White is the largest steel user in Western Michigan, which is significant considering the automotive supply and office furniture business focus in that area. That point is brought home when you step into the factory and are greeted by rolls of steel stacked high and deep. In the company’s receiving and inspection department, water heater components from outside vendors are inspected and subjected to limited random sample quality control testing before they head out to the factory floor for installation, a step that Jones says is critical to the safe performance of their products. Field returns at Bradford White are taken seriously and present an opportunity to practice the company’s focus: customer satisfaction and continuous improvement. The number one finding is “no defect found,” but if there is one, it is investigated to not only find what may have led to the return but also to help improve the product and, in some cases, the manufacturing process. The steps Bradford White takes to investigate issues eliminate problems that, even though not a source of frequent failure, nonetheless reflect on the company’s reputation of quality. One of Bradford White’s quality assurance steps is found in their proprietary enamel formulation that allows it to expand and contract with the tank under water supply pressure variations. It’s because of this enamel, in fact, that Bradford White was the first water heater manufacturer in the industry to raise their standard tank life warranty from five years to six years. 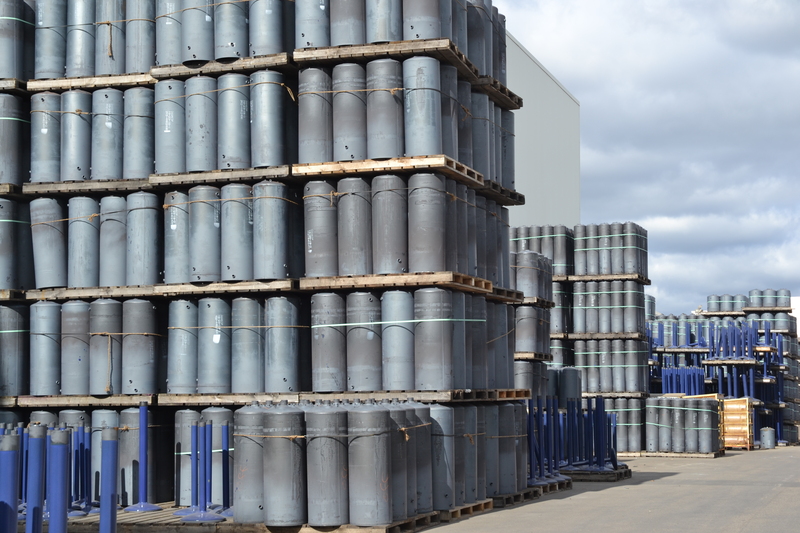 As tanks move through assembly, additional quality steps are taken— what the company refers to as a “no-fail assurance.” There is no good, better, or best at Bradford White; every water heater that leaves their manufacturing facility is the best it can be. In fact, Bradford White tests and validates every single water heater they build. Welding on Bradford White’s residential water heaters is done by high-tech, precision machinery to assure quality and uniformity, including pressure welded seams to prevent even the smallest opportunity for leaks. The only manual weld on any residential water heater is the tie-in weld, applied at the intersection where the top of the tank and the sides meet. This weld ensures that the highest stress point on the water heater is reinforced and allows for a close-up visual inspection of all welds. Another of Bradford White’s proprietary design elements—the Screenlok Technology Flame Arrestor— was developed in-house. It’s designed to resist ignition of flammable vapors outside the water heater and meets the American National Standards Institute’s (ANSI) standard for residential gas water heaters. A sensor recognizes the collar and halts the assembly line until the tank is removed for repair. • The blowing agent used for the polyurethane foam in Bradford White’s water heaters, cyclopentane, helps increase its efficiency and reduces greenhouse gas emissions during the insulating process. wash system, where the chemicals that clean the metal can be adjusted according to this oil content. The cleaned jackets then move into another room where they are powder coated. 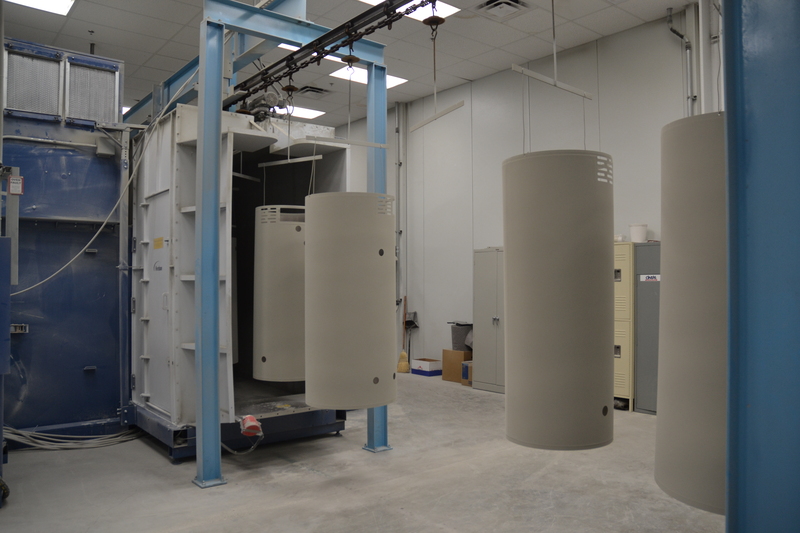 • The powder coating process—rather than traditional painting—not only reduces or eliminates emissions, but also allows the company to paint a variety of jacket sizes at the same time. It’s also more efficient than painting, as excess powder is reclaimed and reused through a vacuum system. 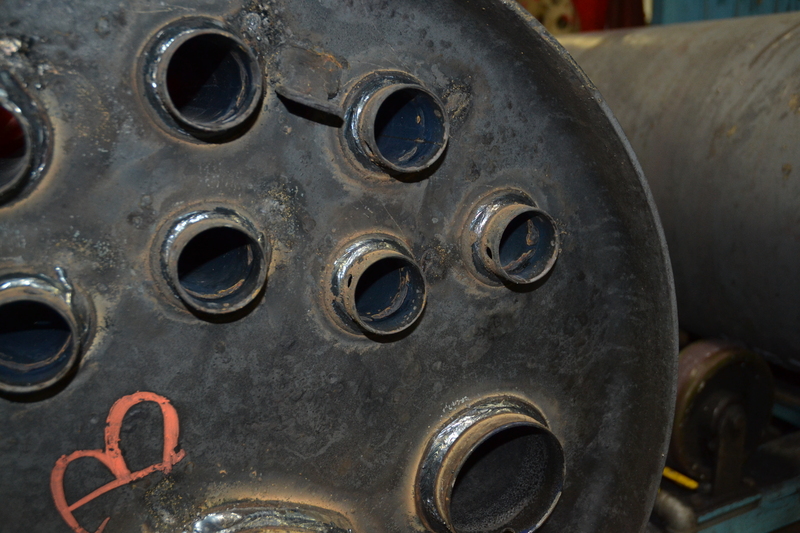 • Bradford White performs two leak test on all tanks prior to assembly—and three tests for ASME rated tanks. If a leak is found during the second step, a yellow collar is placed on the tank; Bradford White’s research and development lab is also a key part of the company’s quality assurance. Here, lab manager Richard Courtade explained that products soon to go on the market are life-cycle tested; if and when they fail, they’re dissected to see what went wrong. Before a product leaves the R&D lab, the company must be comfortable and satisfied with its performance— ensuring that customers will be as well. Because the make-up of natural gas is different in all parts of the world, Bradford White’s R&D lab has natural gas mixed to the constituency of the gas from specific markets of the world to use for testing and therefore ensure products sold there are of the highest quality and dependability. As mentioned earlier, Bradford White is always expanding, and the R&D lab is no exception. Courtade described plans for expanding the walls of the lab about 10 feet, as well as adding space above the lab for the company’s engineers. At a time when most other water heater manufacturers have made their products available by selling directly to consumers through retail channels, Bradford White has continued to sell only to professional installers through wholesale distribution networks. One of the reasons, aside from loyalty to their network of sales representatives and wholesalers, is to ensure their products are installed correctly and safely by trained professionals—yet another measure of quality assurance from one of the industry’s leading manufacturers. 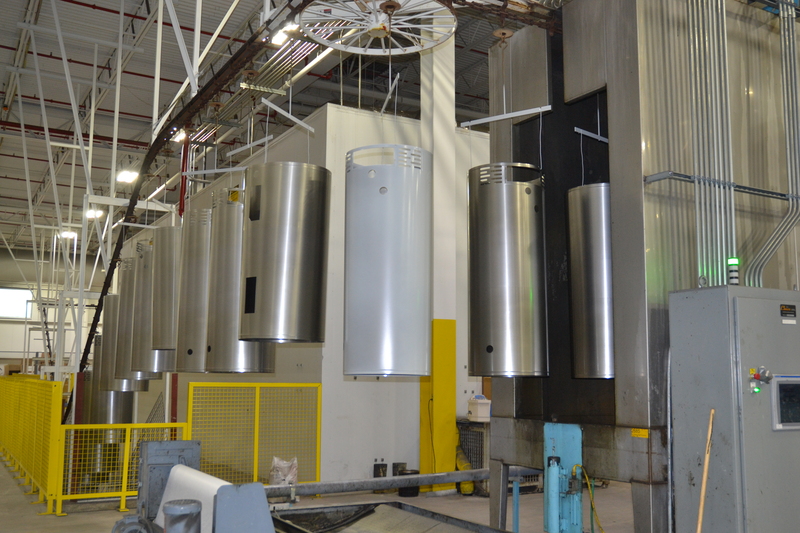 While the residential water heater manufacturing process at Bradford White is more automated, commercial water heaters produced in the Middleville, Mich., factory have a more hands-on approach. 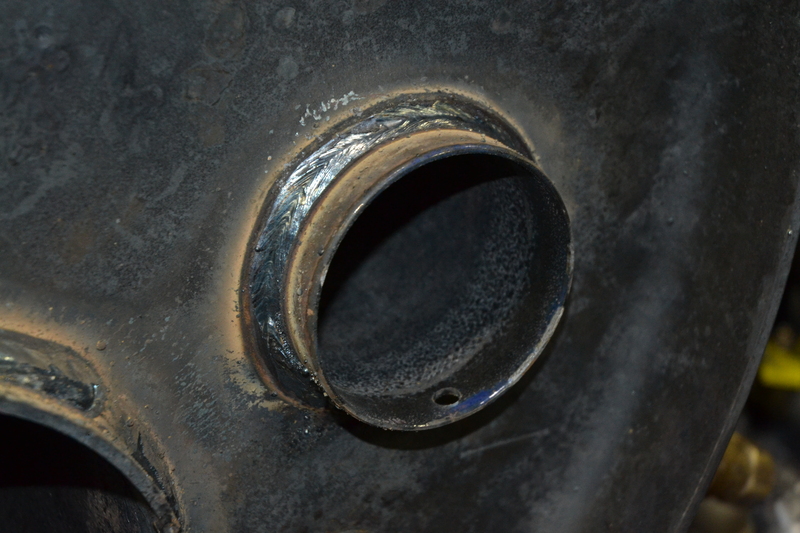 Solid welds are an essential part of any water heater. There are only a small number of automated welds in the production of a Bradford White commercial water heater; all other welds are done by hand. Welding is something the company is serious about: Bradford White employs more than 40 welding artisans, all certified by the American Welding Society (AWS), on the commercial production line. Bradford White’s heat pump water heaters are manufactured in what is essentially a factory within a factory. The company began installation of its heat pump water heater manufacturing lines in 2017 and by January 2018, production was up and running. All of Bradford White’s AeroTherm heat pump water heaters are being produced at the plant, concurrent with the production of their standard gas and electric tank style products.